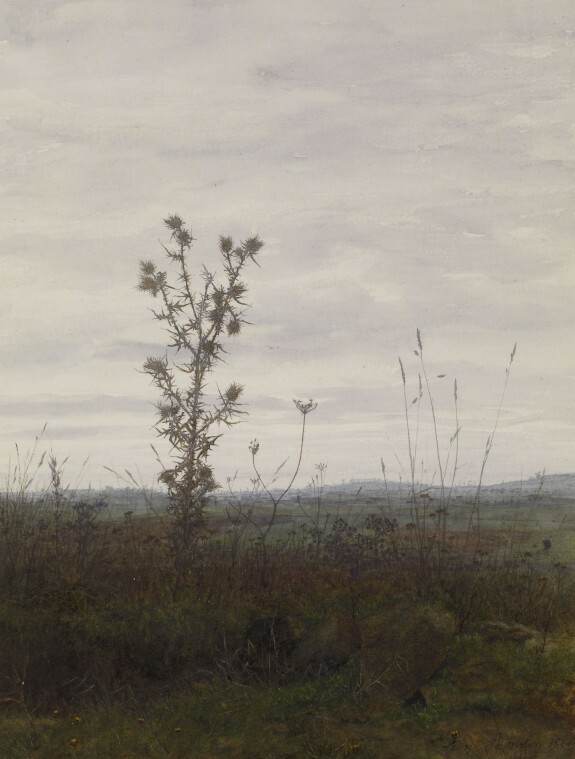 Description "Here again is a fuller's thistle with its silhouette of threatening prickles, some wild carrots, and grasses shooting up in slender tubes; their outlines strike across a sky of light drifting vapors; the line of the horizon is broken by the glacis [slope] of the fort of Issy, and by the outstretched arms of a windmill." Philippe Burty, "Léon Bonvin," Harper's New Monthly Magazine, December 1885, sponsored by William T. Walters Léon Bonvin was born in Vaugirard, just outside Paris in 1834. Despite displaying great talent in the medium of watercolor he was largely unrecognized by his contemporaries. In 1866 he hanged himself at the age of 32, apparently due to financial difficulties. Working at his family's bar or "cabaret," he sketched and painted watercolors only in his spare moments, yet in the seven year period between 1859 and his death he created numerous exquisite still lifes of flowers and fruits, and subtle landscapes capturing fleeting atmospheric effects. There is evidence that, despite his rural home, Bonvin did have knowledge of the art world in Paris. His half-brother was the better known artist, François Bonvin. In addition Bonvin's still lifes show the influence of Jean-Siméon Chardin (1699-1779), whose work was undergoing a revival in the 1850s and 60s. During the 19th century an appreciation of Bonvin's work was confined to a small circle of connoisseurs and collectors, most prominent among them William T. Walters, father of Henry Walters, founder of the Walters Art Museum. For much of the 19th century William displayed and stored his watercolors in a deluxe leather-bound album with a specially commissioned frontispiece and tailpiece by the renowned flower painter of the Lyon school, Jean-Marie Reignier (see WAM 37.1501 and 37. 1531). William's collection of Bonvin's work was acquired between 1862 and 1891, and eventually comprised 56 watercolors and one, rare oil; today, this is the largest collection of Bonvin's work in existence. A Vanishing Meadow: The Watercolors of Léon Bonvin. The Walters Art Gallery, Baltimore. 1994. Near Paris: The Watercolors of Leon Bonvin. The Walters Art Museum, Baltimore. 2012.